In his childhood, Charley drew with coloured pencils. Later on, he used a drawing pen, and for his graphic novel about the Eiffel Tower, he only applied a paint brush. In 1969, Reuvers became seriously acquainted with etching as a technique at an exhibition of graphics by Hercules Segers in the Rijksprentenkabinet in Amsterdam. 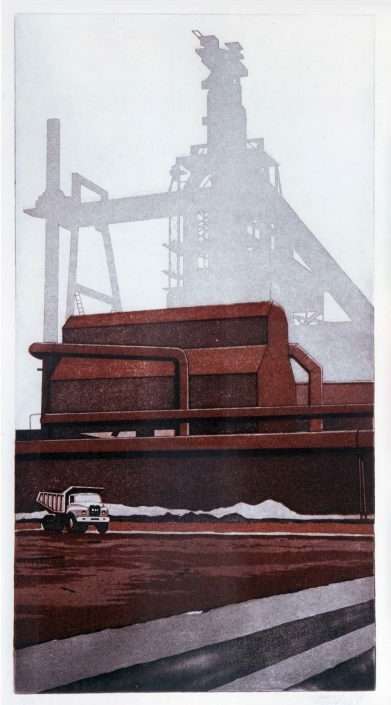 In the 1960’s, etching was a popular medium of art, just like screen-printing. This was partly due to political reasons. Etchings could be reproduced in numerous editions, making art financially more accessible for a larger public. At the time, the technique was so popular at the Gerrit Rietveld Academy that Reuvers could hardly get into the etching studio, if at all. Not until ten years later, in the early 1980’s, did he get to learn the tricks of etching from a colleague lay-outer at the BBK-krant, the trade journal of the Dutch Association of Artists and Sculptors. 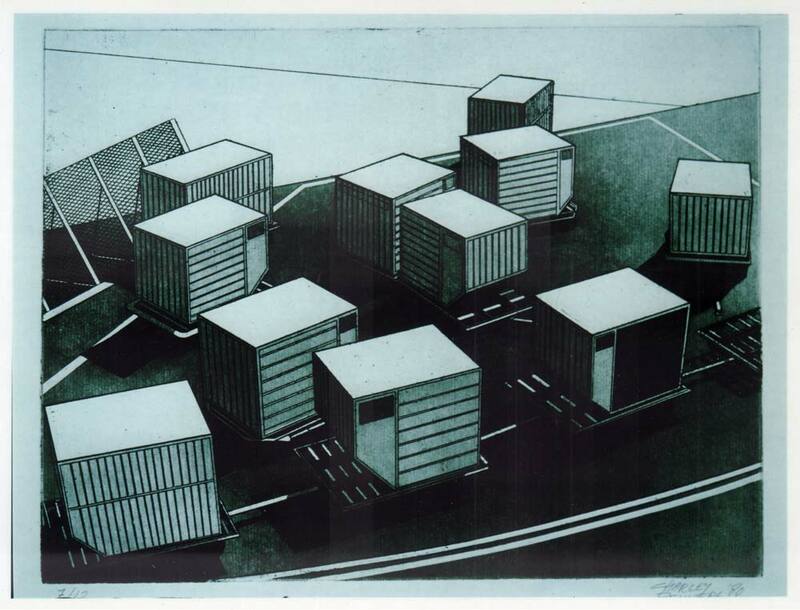 The early hundreds of etchings that Reuvers made in the 1980’s show subjects such as a stack of randomly stationed airplane containers, parts of a companionway at an abandoned airfield, surveillance cameras, drones and monitors. The atmosphere is foreboding, due to the austere composition, the gloomy shadows and, often, the absence of people. 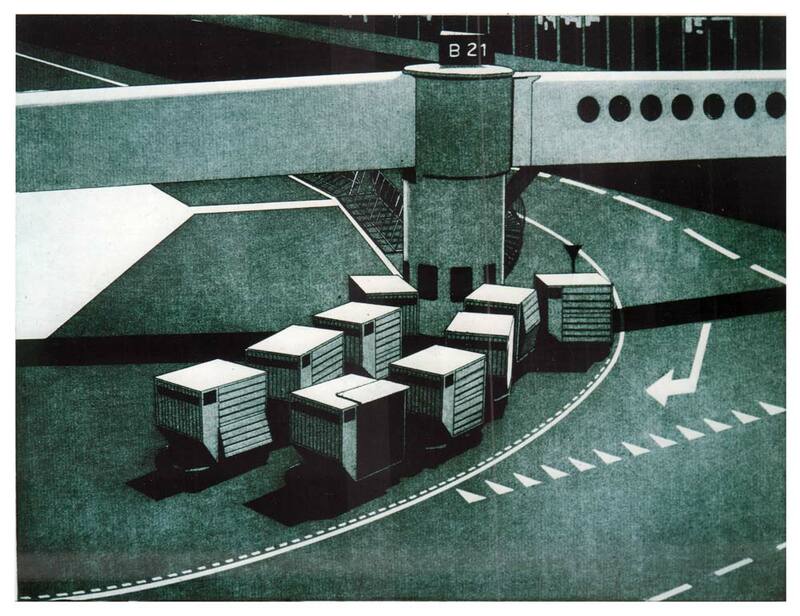 In their way, the etchings indirectly evoke the social tensions and conflicts of the early 1980’s. Charley sat in the epicentre of it all. In the big cities of the Netherlands, youngsters squatted in a growing number of residences and buildings that had been left vacant for years on end on speculative grounds. A wave of vacations led to an escalation in violent encounters between the squatters and the riot police. 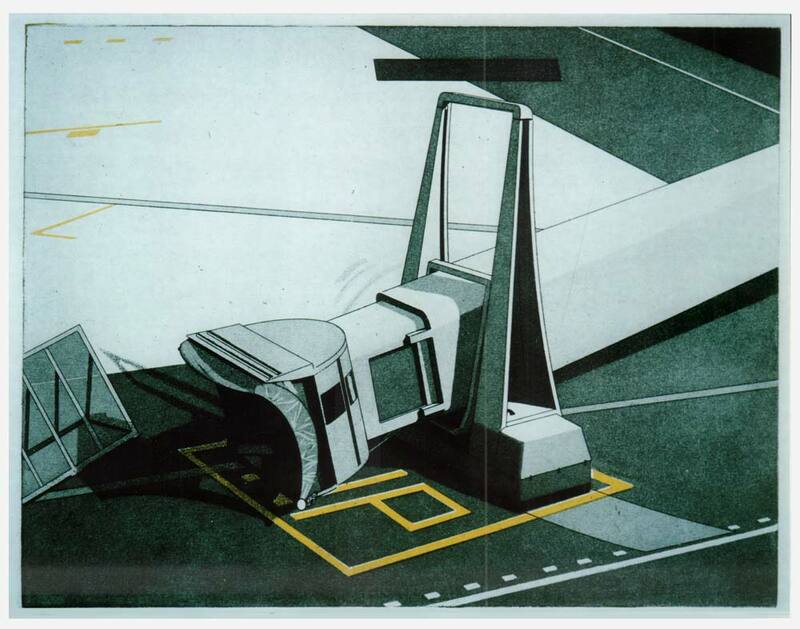 During the vacation of a building in Vondelstraat, armoured vehicles were deployed to break down the barriers which had been erected in the roads. 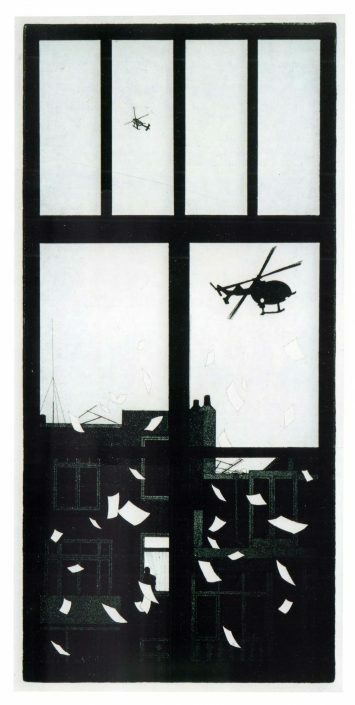 The etching that Charley created based on this incident does not depict the street riots as such, but shows a view from a window over the city, where we see a helicopter hovering above a street some blocks away. The violent vacation, and the chaotic days that proceeded the riots, contrast mysteriously with the steady and elegant whirling-down of the pamphlets. The neighbour watching from his window across the street underlines the palpable discrepancy between the inside and the outside, between being in on the action or not. In other etchings as well, Reuvers chooses to depict not the struggle itself, but, at best, the preparations for it; in some cases, he draws attention to the silent witnesses of such preparations in his distinctive unemotional and meticulous way. 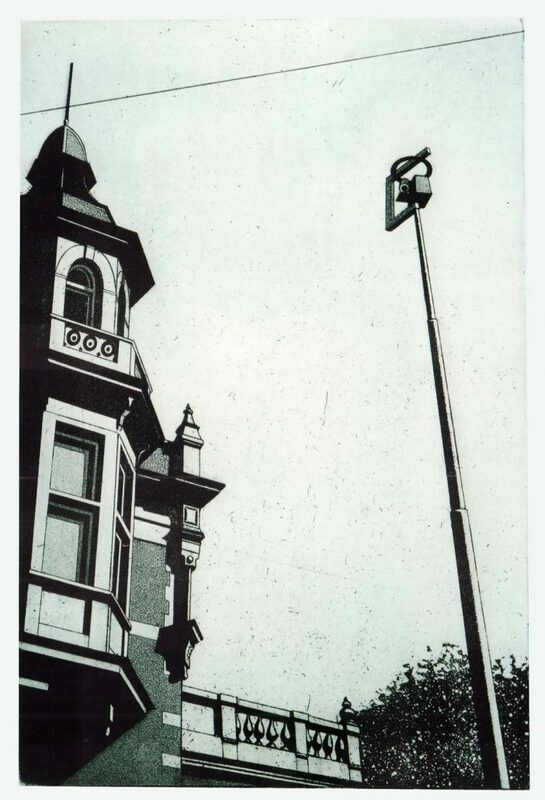 A literal example of the latter is represented by the etching of a surveillance camera; the municipal archives of Amsterdam acquired a print of this etching because, at the time, almost nobody had any notion regarding the function of these inconspicuous devices that turned up everywhere in the townscape. It had struck Charley how all kinds of formerly neutral places, such as construction sites and highways, had all at once been put under close surveillance. In reaction to this, he created a series of three etchings in which he depicts three different types of surveillance cameras set in heavy-duty surveillance settings: a scene with a number of paint-plastered riot police vans at the construction site of the future City Hall and Opera House; a heavily-guarded transport of hazardous materials; and a platoon of the riot police behind an impressive fencing that could have screened off a nuclear plant or a military air base – in those days often the target of protest campaigns. These scenes are completed with a section on the type of drone that has been depicted, including a bar code and a timestamp. This makes the etchings look like cards from an archive. The arrangement and the way in which the drones break through the framework of the image are clearly derived from the vocabulary of comic strips. The influence of comic strips also becomes visible in the frog perspective of Reuvers’ etching on Lekkerkerk. In the town of Lekkerkerk, a new housing estate had to be demolished after the terrain proved to be severely contaminated with toxic waste. Reuvers created a post-apocalyptic etching showing men in yellow hazmat suits and gas masks, surrounded by a herd of cavorting white rabbits. He had once read a story about cages with rabbits being placed in a factory in Belgium where hazardous substances were processed, just like miners used to take canaries into the pit to forewarn them against blackdamp in the old days. With pop temples like Paradiso, countercultural strongholds like Fantasio and the Melkweg, and dozens of coffeeshops that provided easily available marijuana, Amsterdam became an attractive destination for thousands of alternative youngsters from all over the world in the 1980’s. Most of them travelled on a shoe-string. Charley had a part-time job at a sleep-in in downtown Amsterdam, where backpackers, hippies, drop-outs, hobos and speed freaks could stay the night for ƒ 3.50. Charley kept order after a fashion. Sometimes, there would be outside threats, such as Czech security officers who wanted to check the passports of fellow-countrymen; at other times, there would be inside threats, such as guys who tried to bypass the official house dealer by selling drugs themselves. Charley lived in a squat until the municipality offered him a spot in a former primary school in the de Kinkerbuurt-area. Both his children were born there. For his daughter, he created the etching which depicts the electric eel in the aquarium of Artis zoo. His daughter was fascinated by the mysterious fish in the turbid green water. 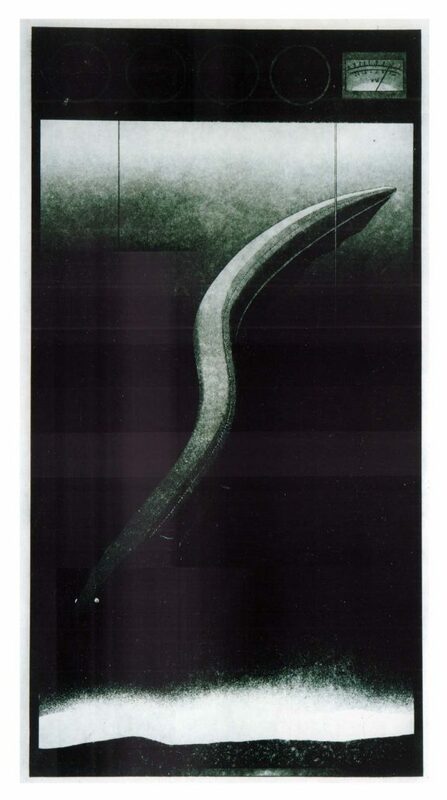 As a child, Charley had been impressed by it too, especially by the fact that the electric current that the blind knifefish discharges on and off (its way of reconnoitring the area) can be read out on a small meter above the tank. Many representations that Charley had etched are marked with timestamps, barcodes and/or gauges. 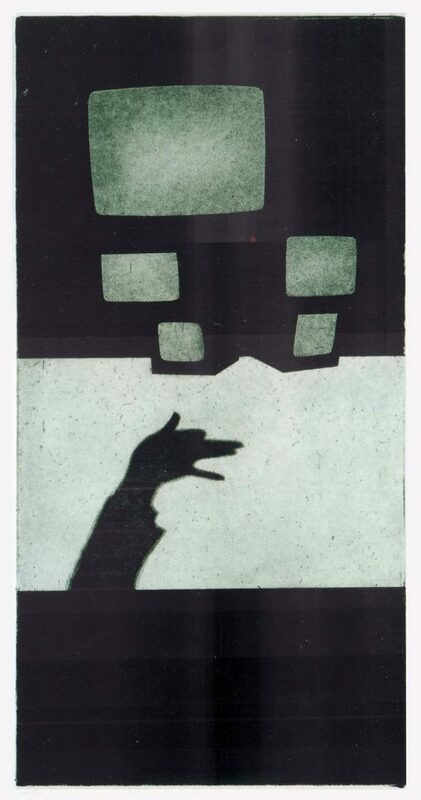 By doing so, he had succeeded in combining various forms of observation and perception within each single etching. 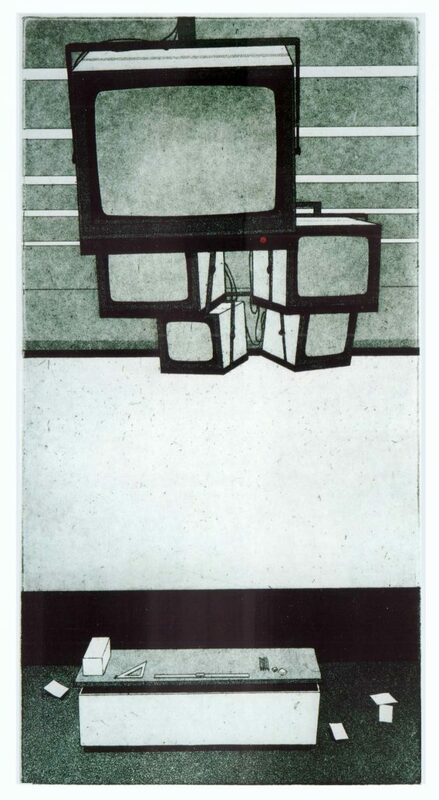 In the adjoining etching, he juxtaposes the image of a collapsing building during an earthquake with the readings of a seismograph. He evokes the rocking of the building by depicting it with a similar motion blur, which we are familiar with from the snapshots of a moving camera. Paradoxically, the objective, scientific registration by the seismograph reinforces the emotional impact of the image. It is almost as if it has been proven scientifically that the representation of the tragedy is not hyperbolic. The fact that Reuvers was earnest about this scientific detachment, and that he would not be satisfied with simply implying such a distance, as his friends had advised him to do, was underpinned by his intention to reproduce the seismogram in the etching by means of a home-made seismograph. In order to realize this plan, he ordered about twenty cardans at a model making shop. It proved to be an incredible waste of money, especially for an artist with hardly any money, since the joining together of the various cardans resulted in such play that the apparatus turned out to be completely unreliable. Reuvers had to admit that, in some of his projects, he let his feelings run away with him; since then, he had firmly resolved to put a post-it note on the calendar before making another expensive acquisition, so that he could check if he was still as keen to purchase it after a week or so.